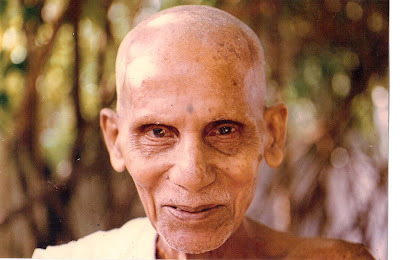 A week or so ago Sundaram Swami, who was both Annamalai Swami's interpreter and his ashram manager, lent me two albums of Annamalai Swami photos. I had asked to see what he had collected since I was planning to include some new photos in the next printing of Final Talks. There were many photos in the album I had never seen before, and I am sure that most readers of this blog will not have seen them before either. I asked for his permission to post some of them here, and he happily agreed. First, though, here are some older photos, taken in the 1930s, when Annamalai Swami was working in Ramanasramam. 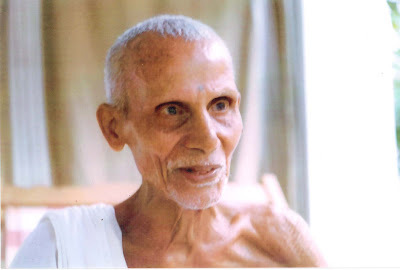 These have been taken from the Sri Ramanasramam Archives and are reproduced here with the kind permission of the ashram president. 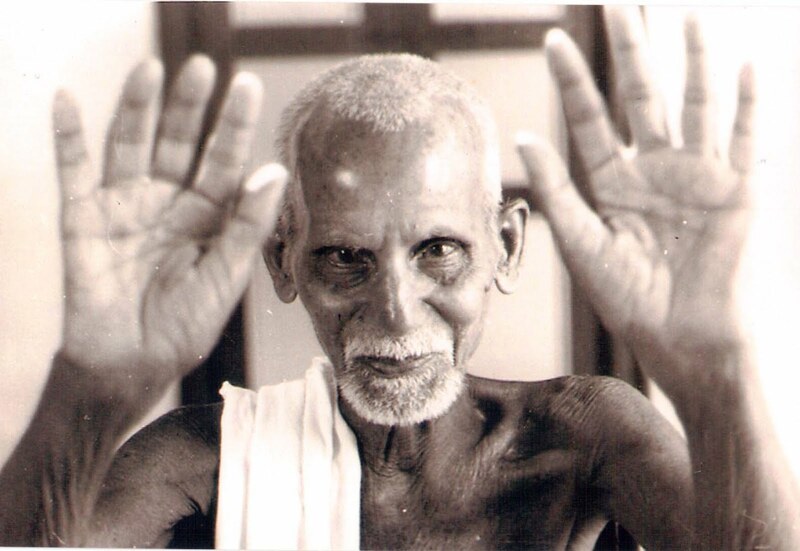 This is the cover photo of Living by the Words of Bhagavan. 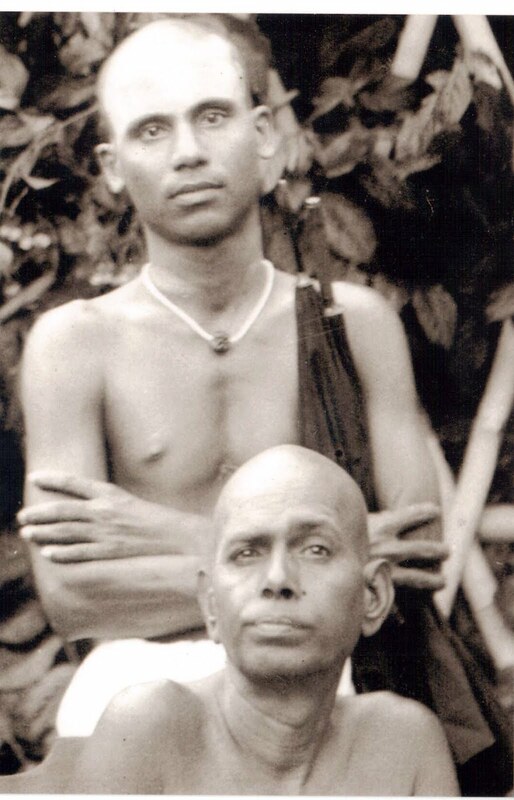 When I was looking for old photos of Annamalai Swami the 1980s, he told me he was usually easy to spot in group pictures because of three features: folded arms, copious vibhuti on the forehead, and a necklace containing a single rudraksha bead. 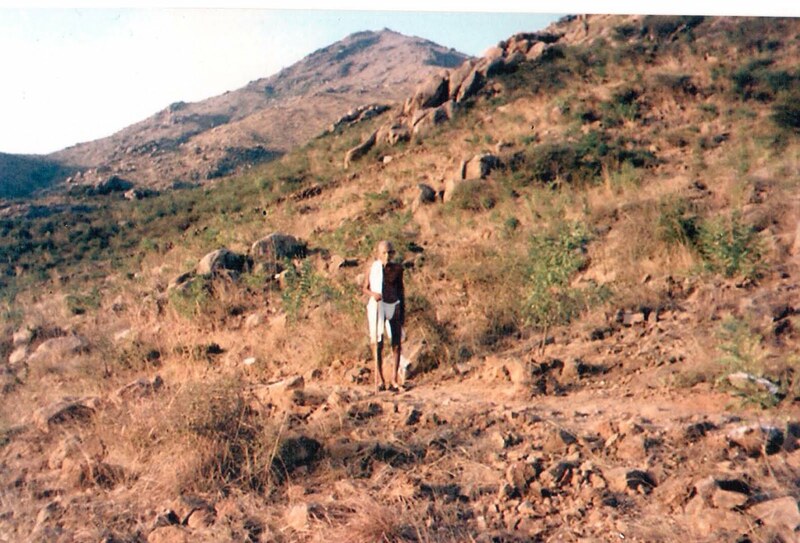 In these two photos Annamalai Swami is taking Lakshmi out to graze on the lower slopes of Arunachala. 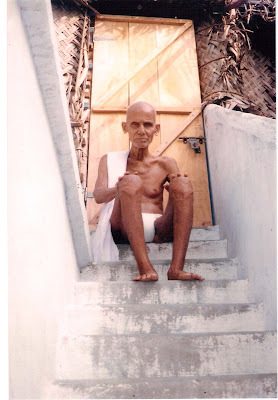 The next photo, of Annamalai Swami standing outside the ashram kitchen and storeroom in the 1930s, turned up fairly recently in an album of pictures that had been taken or assembled by Dr Mees. 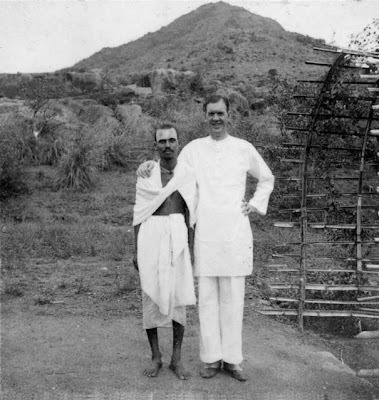 The same album contained this photo of Chadwick and Annamalai Swami. 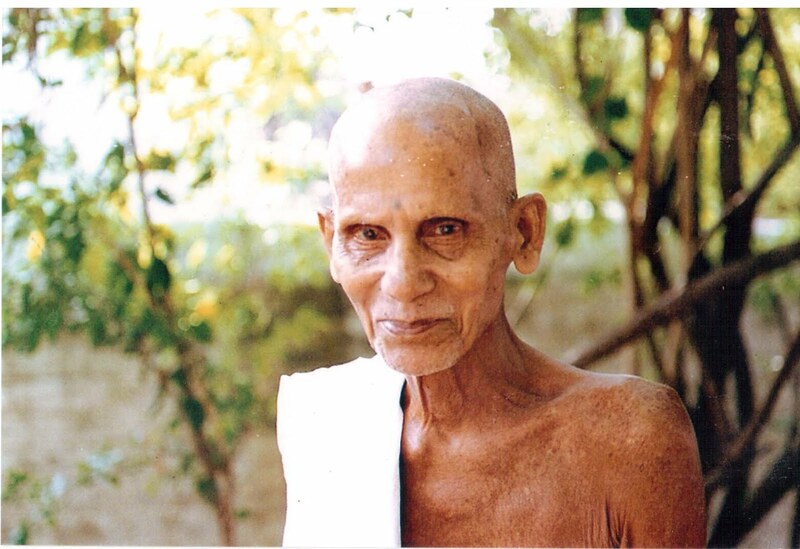 I included it in the most recent edition of Living by the Words of Bhagavan. 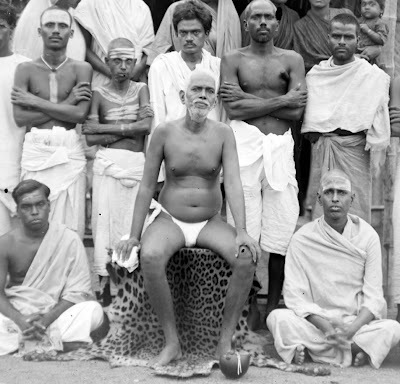 Left to right, top row: Annamalai Swami, Ramanatha Brahmachari, not known, Ramaswami Pillai, Kunju Swami. 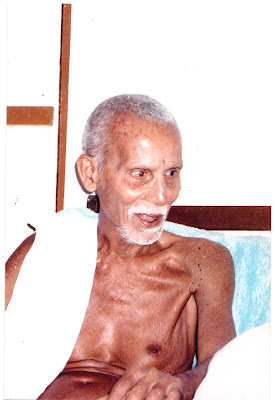 Sitting: T. P. Ramachandra Iyer, Bhagavan, Chinnaswami. Here is Annamalai Swami in some other group photos of this era. 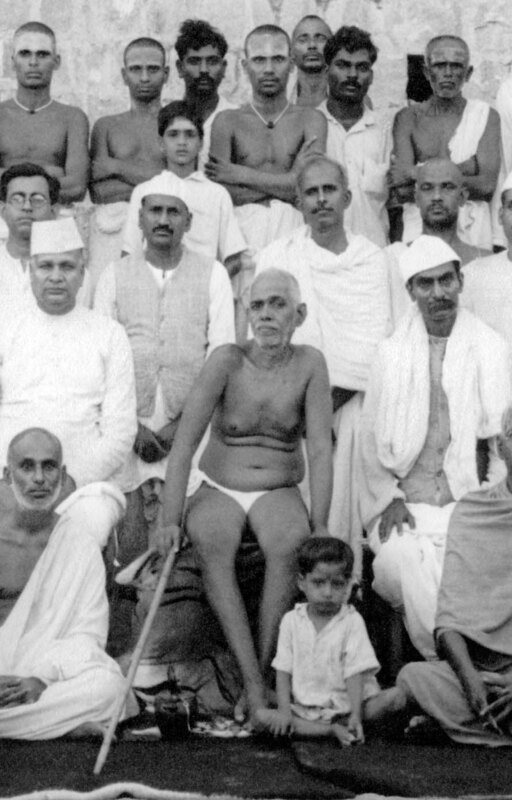 Look for the man with folded arms, vibhuti, and a rudraksha necklace. There are two people here with vibhuti, a rudraksha necklace and folded arms. 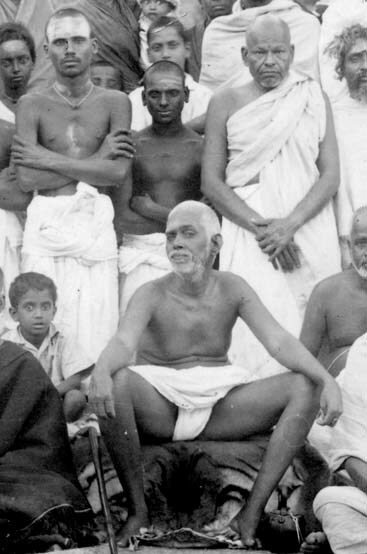 The one in the centre is Annamalai Swami while the one on the extreme left is Madhava Swami, Bhagavan's attendant for most of the 1930s. The next three show Annamalai Swami walking on Arunachala in the 80s or 90s. He went for a walk there every day. 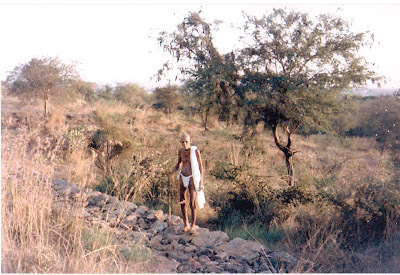 Regular visitors to Ramanasramam will note that this area is now well reforested. In Annamalai Swami's later years it was mostly bare rock, lemon grass, and the occasional thorny bush. 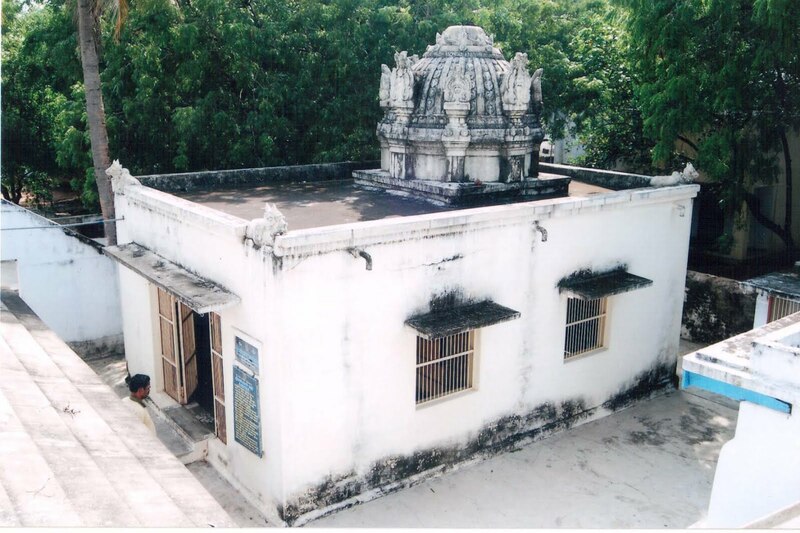 This is the small room where Annamalai Swami met with visitors in the 1980s and 90s. 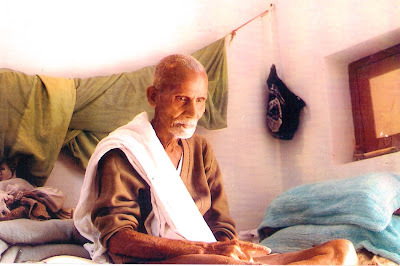 The devotee on the floor, reading to him, is Sundaram. 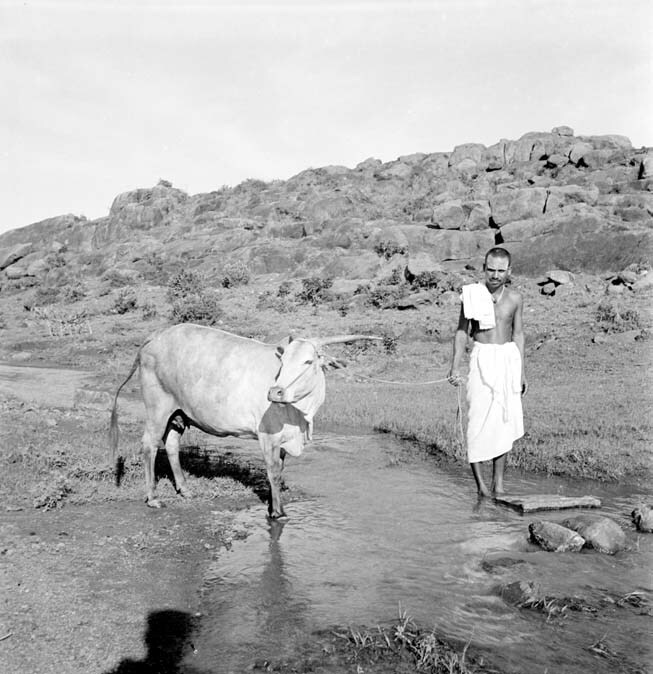 And finally, here is a selection of photos I found in Sundaram's albums. 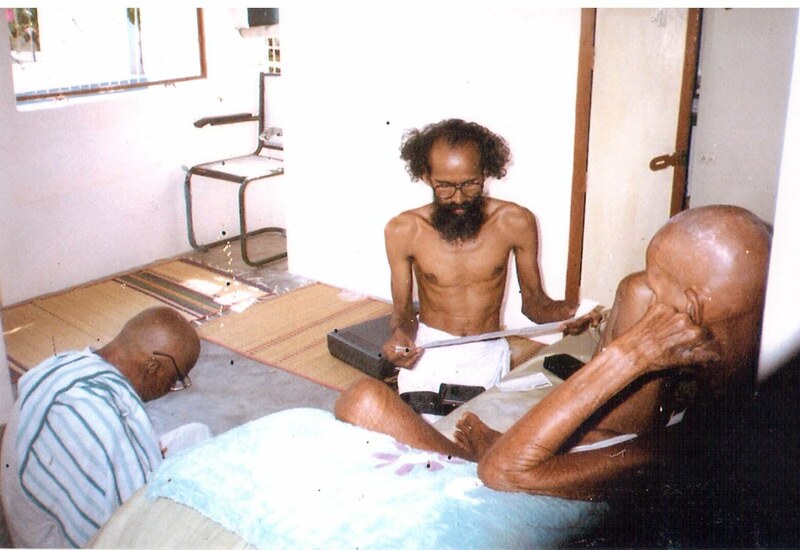 They were all taken inside Annamalai Swami's ashram in the 80s and 90s. 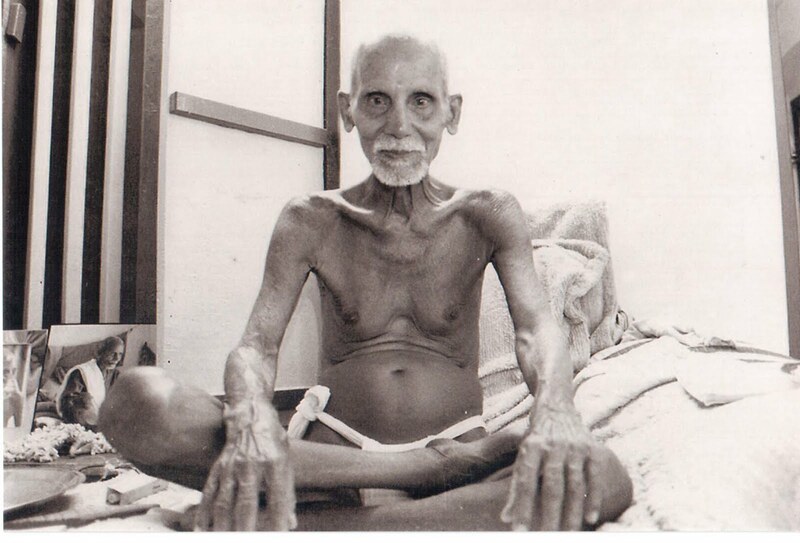 The final photo is of Annamalai Swami's samadhi shrine. Sri Bhagavan. 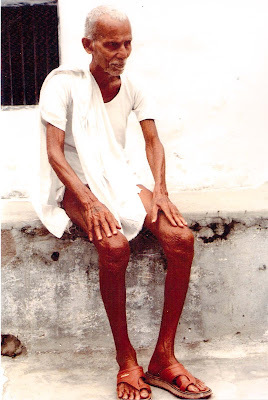 One photo, that is the first one, is in the cover page of Kadaisi VarthaigaL, Tamizh edition of Final Talks. The later photos, where he looks obviously quite old and one wearing spectacles - are rare and are seen only now through your article. THANK YOU VERY MUCH for publishing these precious pictures of Sri.Annamalai Swami on the web. 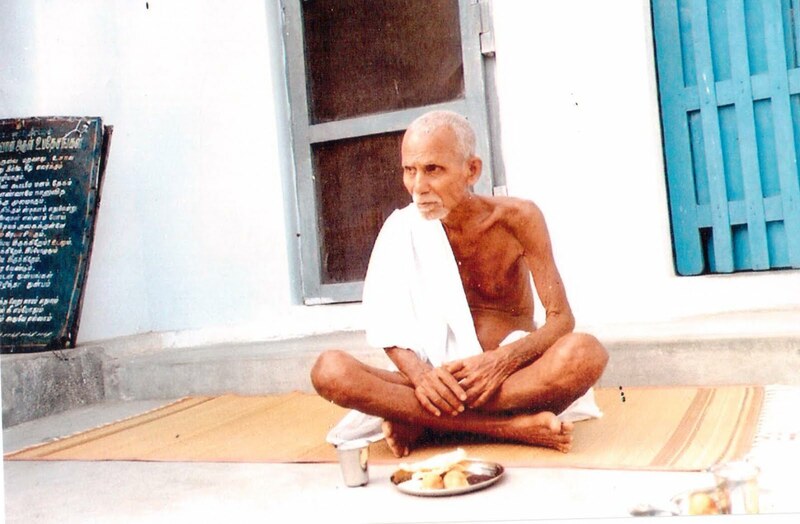 Om Namo Bhagavate Sri. Ramanaya. 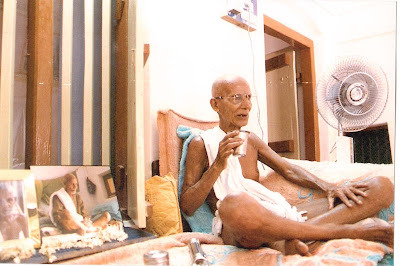 Good photographs of annAmalai swami! I guess the third photograph from the top in sundaram's collection is taken in swami's samadhi room.In swami's days,this room had walls painted with verses from Sri Bhagavan.Swami had already identified this place as the one where his body should be interned.After his passing away,the walls of this samadhi room have been whitewashed.Do not know who had this bright idea! His appearance is more majestic that the mountain. 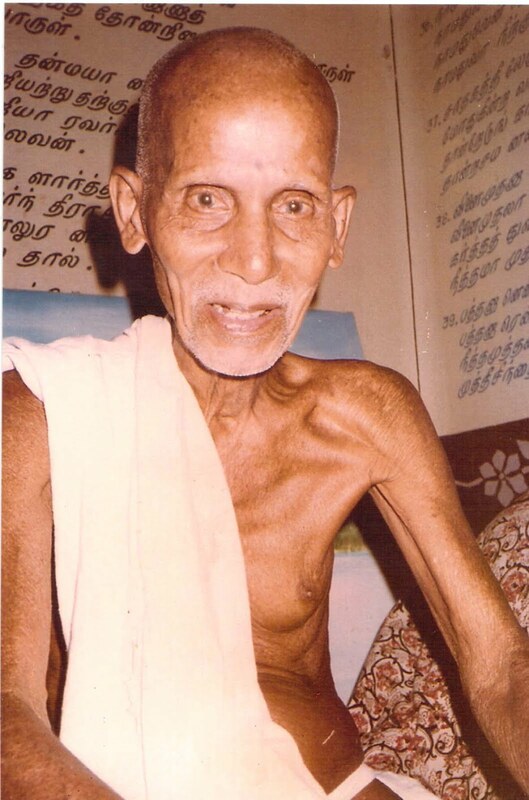 Swami got this photograph made somehow and approached Sri Bhagavan and requested him to write the Tirukkural right at the top of the photograph. 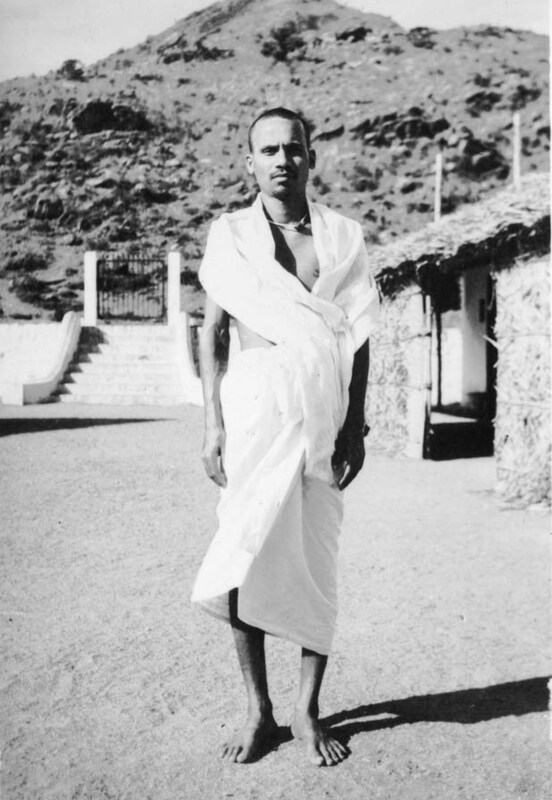 This photograph was with AnnAmalai Swami and a Good old friend of mine requested the Swami and took copies of this photograph. It is this copy that reached me unexpectedly,after nearly 20 Years!I had almost forgotten about it. It is spotted in a few places but still quite okay.I will try to see if any professional lab can restore/make copies of it. If you happen to meet Sri Sundaram,you may enquire if he knows about the whereabouts of the original which was with Swami. "In these two photos Annamalai Swami is taking Lakshmi out to graze on the lower slopes of Arunachala." Very nice photograph.David,just now saw that the two photographs are one and the same. Annamalai swami is full of grace in his later years. I agree with the last comment. He is full of grace in his later years. The snap where he is taking some fruit from a devotee with the bearded gentleman in front reminds me for some reason of kanchi sankaracharya Sree Chandrasekhendra Saraswati There is a grace, kindness and peace in the photo that can't be explained. Thanks. 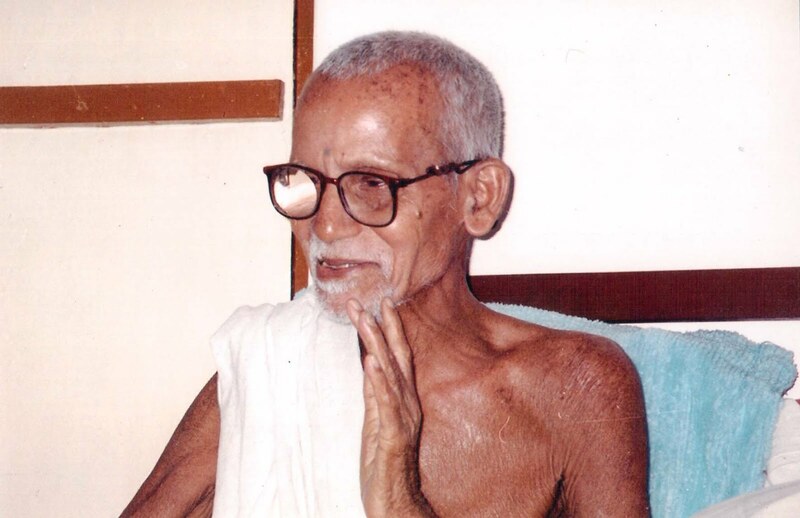 I keep reading and re-reading many of your books on Bhagavan's disciples. 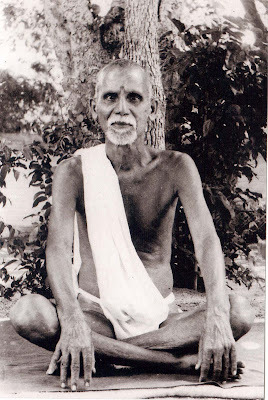 Among them, Living By The Words of Bhagavan. 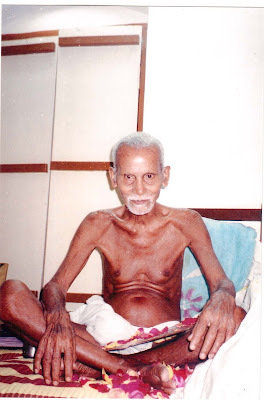 I also happen to be aregular reader of your blog. I keep checking for new posts. I hadn't done that for a few days because,I suppose, I got occupied with my work. But today, just a few minutes ago, I was pleasantly surprised: there was a new post on your blog - and some hitherto unpublished photos of Annamalai Swami. Thank you David. 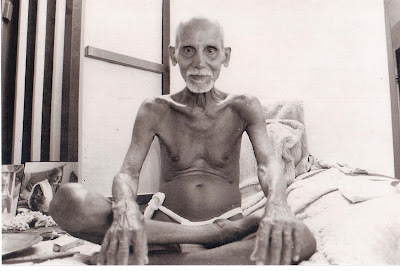 There I was looking and marveling at those images -- Swami in his youth, Swami in his old age (Yes, as someone has pointed out, in his later years he looks so much like Kachi Periawal) -- on my laptop, and there was the book (Living By....)on my bed just behind my desk: as usual I had read some pages from it at random last night, as is my wont. As I told you once, your books brought me to Bhagavan. And I keep going back to them everytime I feel low. 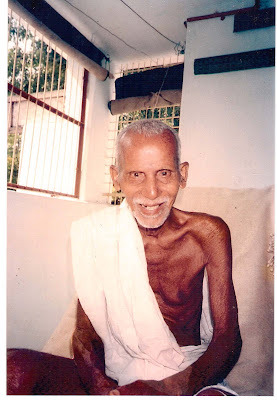 Heartfelt thanks for your wonderful post on our beloved and revered Annamalai Swami. Can you tell us anything about Bhagawan sitting on tiger skin? My understanding is that tiger skin is typically used by sanyasis, and as per one of your earlier posts, Bhagawan declared that he was not a sanyasi. I am going through a traditional text by name ' The method of the vedanta' written by one swami satchidanandendra' translated into English by A.J.Alston. There is this following passage in the text: " There is however this difference between the examples and the thing they illustrate. In the examples, the snake and the rest do not really exist in the rope and the rest. It is simply that the perceiver erroneously supposes the snake and the rest to be there, and thinks and speaks accordingly. The case with the thing these examples illustrate, namely illusions in regard to the Self or Absolute is somewhat different. Here we have a case of practical experience of relation with the Self set up by erroneous knowledge. 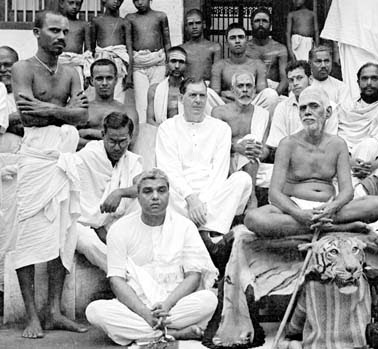 The difference is that here even the notion that the erroneous knowledge ever belonged to the Self , as well as its cancellation, are both seen to belong to the realm of ignorance. In the case of such superimposition as the rope-snake, each superimposition is experienced as wrong notion. Similarly, the superimposition of the not-self onto the Self is also experienced as wrong notion. But occasional wrong notions such as the rope-snake arise and suffer cancellation while the individual knowing the subject remains in being as such. This, however, is not the case with the superimposition of the of the non-self onto the Self. For the superimposition onto the Self of the notion that it is an individual knowing subject is part of the general superimposition of the not-self onto the Self. And when that later superimposition is cancelled, the whole notion of an empirical experiencer is cancelled with it. One cannot conceive this root-superimposition of the not-self onto the Self as having any beginning or an end in time. For time itself comes into existence with this superimposition. And the authorities speak of it as beginning less and endless. 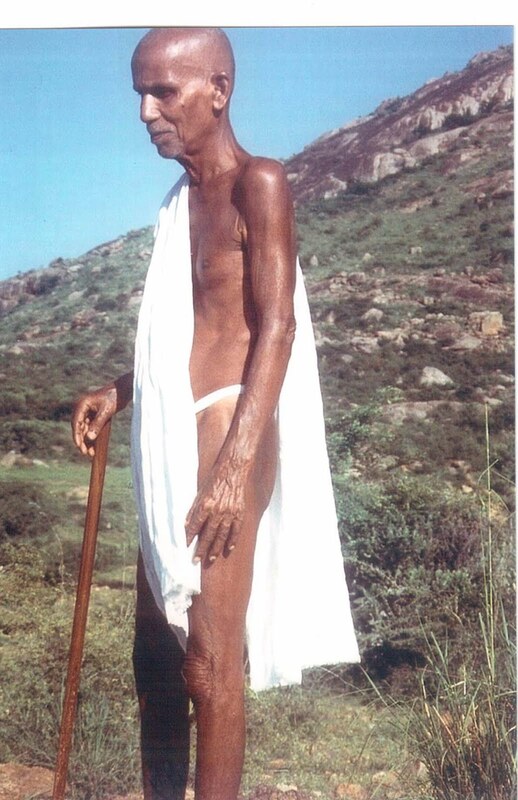 And it must not be forgotten that we have already shown of ignorance and enlightenment itself belongs to the realm of ignorance." These statements seem to be too tough and aphoristic to be understood. Or is it mere sophistry that the author is indulging in to show that the superimposition has never happened in the three periods of time as time itself is part of the superimposition. 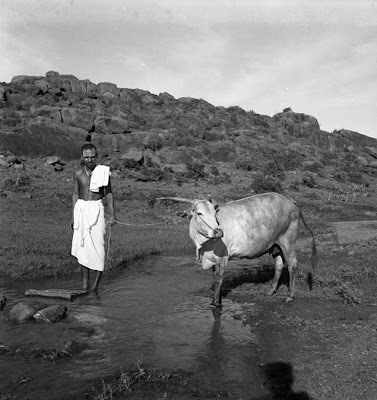 Can these statements be equated with what is being said in verse 90 of 'Guruvachaka Kovai" which reads as follows. " 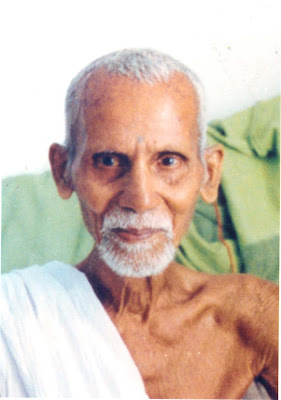 The reality is that conciousness is indeed the Self. This world is objejctified-consciousness, a distortion [ within consciousness]. If a rope [ truly ] existed as consciousness, would it seek someone else- a separate being- to become a snake. 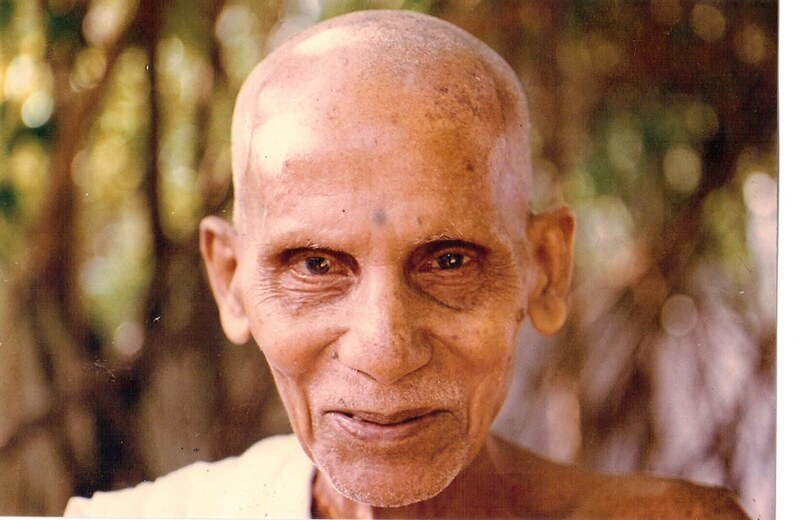 Would you please kindly explain the above traditional statements in the light of what has been said in verse 90 of Muruganar's work. Or if it seems to you that all these things constitute a mere verbal quibble, please ignore it. Please do not waste your time here; better proceed to the nearest Church or even wherever you are, Pray to Lord Jesus to give you a sane mind and genuine devotion.Spend your time reading and assimilating the Bible. Eat Healthy food ,preferably vegetarian,exercise regularly- a morning daily walk of 2 Kilometres would do.Earn your living honestly and sleep peacefully. John Sommers posts the same stuff here about once a month. Usually, I get a notification from the blog that someone has posted a new comment. When his name appears in my in box, I immediately go to the blog and delete his comments. This time, though, I didn't get any notification that he had posted, except through the replies of others who had read his remarks and commented on them. It gave me a peace of mind after going through the article. Thank you so much. I was extremely thrilled to see the photos of the Most Rev. 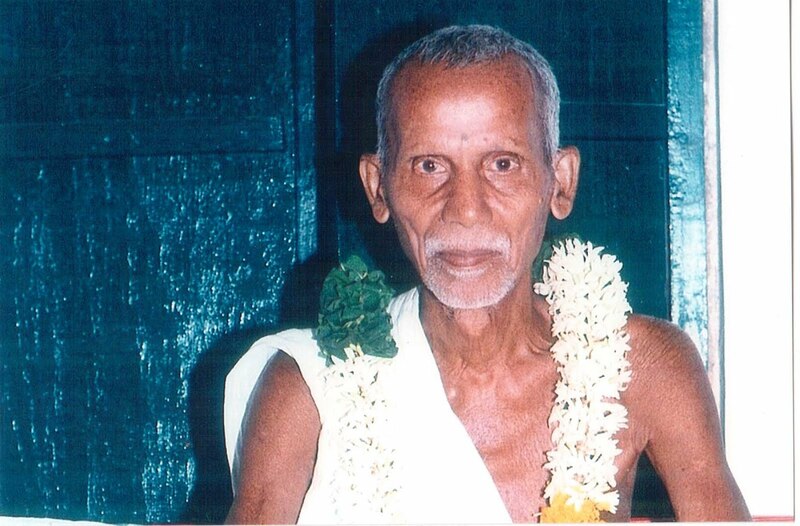 Annamalai Swamigal. 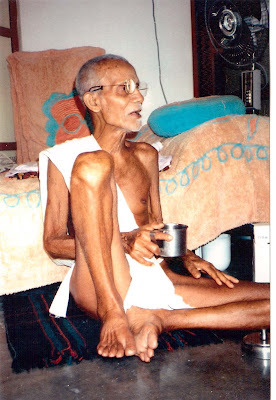 During my younger days in mid 80s and early 90s I used to visit Ramanashram every year during October and spend about 10 days in the ashramam. 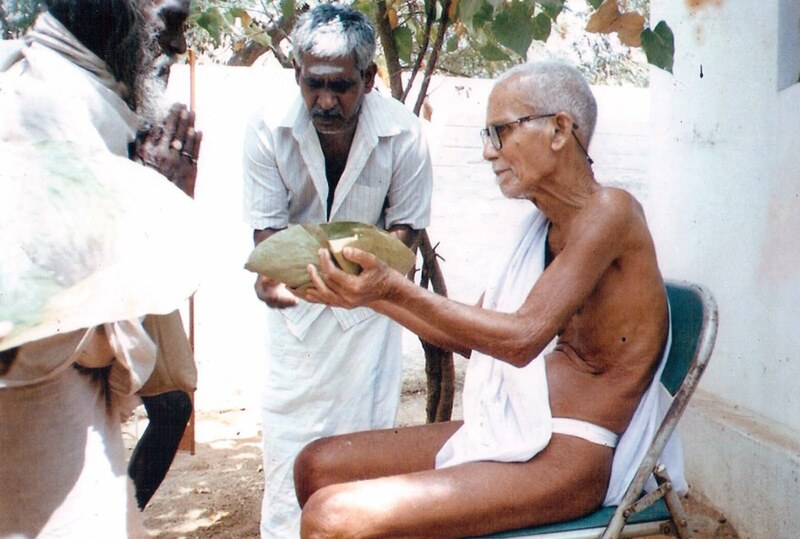 I used to go for giri valam and always used to visit Annamalai ashram and had darshan of Annamalai Swamigal. These impressions are ever green in my mind. 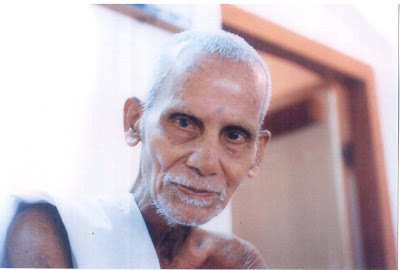 when I see the photos after a gap of 20 years, I got immense pleasure and happiness. I am grateful to all those involved in bringing out the rare photos of a rare Mahan. which Jim had with Annamalai Swamigal which is available on the you tube now.It really gave me an opportunity to see the saint though I couldn't see him when he lived.